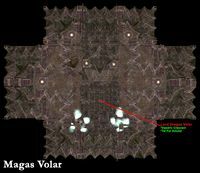 Magas Volar is a Daedric shrine that is not physically connected to any location in Morrowind, and is only accessible by means of a certain magic amulet. This location can be accessed only by using the Daedric Sanctuary Amulet found in a Small Ornate Lockbox in Tel Fyr. 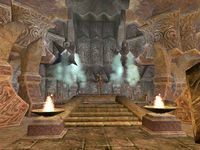 Equipping the amulet will instantly transport you to this Daedric shrine, where you will be attacked by the powerful Dremora Lord Dregas Volar. He will be wielding the Daedric Crescent, a unique 2-handed long blade. After you defeat him, you will be instantly transported back to Tel Fyr (even if that's not where you were before), with the Daedric Crescent in your inventory. The Daedric Sanctuary Amulet will disappear. Defeating Volar is almost the only way to escape from this location. Divine Intervention and Almsivi Intervention spells will not work here; in earlier versions, both effects work (Almsivi takes you to Vivec and Divine to Pelagiad). Recall works, but of course, not if you used a Mark and Recall to transport yourself back to Magas Volar, as you can only have one Mark at a time. Originally, the corpse of Volar carried the Daedric Crescent and the Tel Fyr Amulet, which was supposed to bring one back to Tel Fyr. However, the amulet-scripting inside the game is bugged and actually freezes the game as soon as it is worn. Therefore the game was changed and you are transported back as soon as the Dremora drops dead. The weapon is simply put into your inventory, and the old amulet is removed. The dead Dremora was not changed and still carries the amulet and weapon. This issue has been addressed by the Morrowind Patch Project; the amulet functions properly, although it does not vanish after use as originally intended. For a split second after killing Volar, it is possible to loot his corpse before you are transported back to Tel Fyr, thus ending up with two Daedric Crescents. This requires expert timing, but it is the only method of acquiring two without using console commands or alternative methods of teleportation. Items with scripted teleportation on them, such as the three vampiric amulets or the Barilzar's Mazed Band from Tribunal will still work. This page was last modified on 22 November 2018, at 03:38.